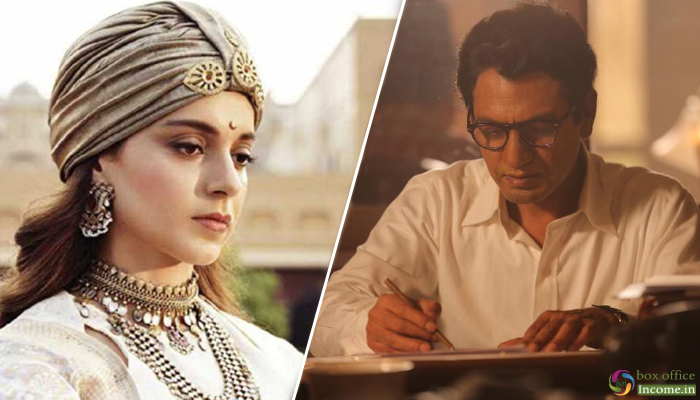 Manikarnika & Thackeray 2nd day Collection, Remain Strong on Saturday at the Box Office! After a solid start at the domestic box office, the highly-anticipated Manikarnika: The Queen of Jhansi managed to remain strong on Saturday as well. Starring Kangana Ranaut in lead roles, the epic biographical period drama film was released amid the huge excitement of fans and expectedly got a warm welcome. Directed by Krish, Manikarnika got succeed to hit the target right and making the desired impact on viewers across the country. This mega action entertainer took a solid start on the opening day and registered the business of 8.75 crores from 3000 screens nationwide including Hindi, Tamil and Telugu languages. On the next day i.e. Saturday, on a strong note, Kairos Kontent Studios’ production bagged the amount of 18.10 crores and raised its 2 days total collection to 26.85 crores from 3000 screens across India including Hindi, Tamil & Telugu versions. The Kangana Ranaut starrer is now set to score the biggest opening weekend of 2019. On the other hand, the much-awaited Nawazuddin Siddiqui & Amrita Rao has also got succeed to impress many in theatres and received positive reviews from the critics. This bilingual biographical opened on a solid note on Friday and collected 6 crores from India. On Saturday, Abhijit Panse’s directorial witnessed a decent jump and minted the amount of 10 crores. With this, its 2 days total collection has become 16 crores at the Indian box office. The film is already Nawazuddin Siddiqui’s highest solo grosser after Manjhi The Mountain Man (12.53 crores) and now it has to be seen how much further does it go from here.